Atkinson, R. N. Chhetri, J. 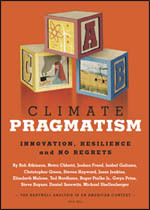 Freed, I. Galiana, C. Green, S. Hayward, J. Jenkins, E. Malone, T. Nordhaus, R. Pielke Jr., G. Prins, S. Rayner, D. Sarewitz, and M. Shellenberger (2011), Climate Pragmatism: Innovation, Resilience and No Regrets. The Hartwell Analysis in an American Context, 32 pp., Published July [pdf]. Hale, B. 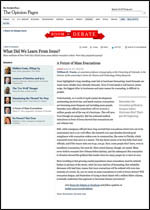 (2011), Nonrenewable Resources and the Inevitability of Outcomes. The Monist 94 (3) 369-390 [pdf]. 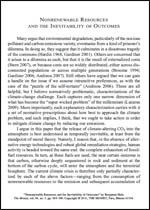 Excerpt: Many argue that environmental degradation, particularly of the noxious pollutant and carbon-emissions variety, eventuates from a kind of prisoner’s dilemma. In doing so, they suggest that it culminates in a disastrous tragedy of the commons (Hardin 1968; Gardiner 2001). Others are concerned that it arises to a dilemma as such, but that it is the result of externalized costs (Stern 2007), or because costs are so widely distributed, either across disconnected populations or across multiple generations (Broome 1994; Gardiner 2006; Andreou 2007). Still others have argued that we can gain a handle on the issue if we assume intransitive preferences, as with the case of the “puzzle of the self-torturer” (Andreou 2006). These are all helpful, but I believe normatively problematic, characterizations of the climate-change challenge. Each captures only one narrow dimension of what has become the “super wicked problem” of the millennium (Lazarus 2009). More importantly, each explanatory characterization carries with it a set of normative prescriptions about how best to approach the climate problem, and each implies, I think, that we ought to take action in order to mitigate climate change by reducing our emissions. 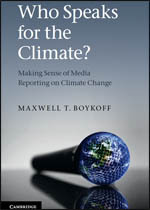 Max Boykoff’s new book, Who Speaks for the Climate? Making Sense of Media Reporting on Climate Change, will be available soon. This book provides a “bridge between academic considerations and real world developments, and helps students, academic researchers and interested members of the public make sense of media reporting on climate change as it explores ‘who speaks for climate’ and what effects this may have on the spectrum of possible responses to contemporary climate challenges.” Order your copy. Pielke, Jr., R. A. 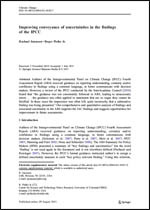 (2011), Improving conveyance of uncertainties in the findings of the IPCC. Climatic Change, Published August 9 [pdf]. Abstract: Authors of the Intergovernmental Panel on Climate Change (IPCC) Fourth Assessment Report (AR4) received guidance on reporting understanding, certainty and/or confidence in findings using a common language, to better communicate with decision makers. However, a review of the IPCC conducted by the InterAcademy Council (2010) found that “the guidance was not consistently followed in AR4, leading to unnecessary errors . . . the guidance was often applied to statements that are so vague they cannot be falsified. In these cases the impression was often left, quite incorrectly, that a substantive finding was being presented.” Our comprehensive and quantitative analysis of findings and associated uncertainty in the AR4 supports the IAC findings and suggests opportunities for improvement in future assessments. Pielke, Jr., R. A. 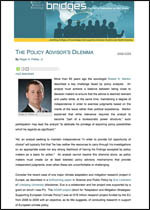 (2011), The Policy Advisor’s Dilemma. Bridges 30, Published July 20. Travis, W.R. (2011), A Future of Mass Evacuations. New York Times, Published August 29. Excerpt: Irene highlighted a long-standing weak link in hurricane forecasting: track forecasts are much more reliable than intensity forecasts. Even if wind speed is well known, storm surge, the biggest killer in hurricanes and main reason for evacuating, is difficult to predict. 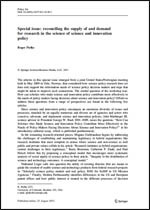 The 2011 special issue of Policy Sciences includes papers for a workshop titled “Reconciling the Supply of and Demand for Research in the Science of Science and Innovation Policy” held in 2009 in Oslo, Norway. This workshop brought together academics, practitioners, and those with feet in both worlds to examine how science policy research does (or does not) support the information needs of science policy decision makers. View all the papers in this special issue.